COOK -Kaart van de Societeit Eilanden ontdekt door Luit. J. Cook in het jaar 1769. N° 111. COOK, Captain James. - Kaart van de Societeit Eilanden ontdekt door Luit. J. Cook in het jaar 1769. N° 111. Kaart van de Societeit Eilanden ontdekt door Luit. J. Cook in het jaar 1769. N° 111. - COOK, Captain James. Title : Kaart van de Societeit Eilanden ontdekt door Luit. J. Cook in het jaar 1769. N° 111.. Size : 11.3 x 16.9 inches. / 28.8 x 42.8 cm. 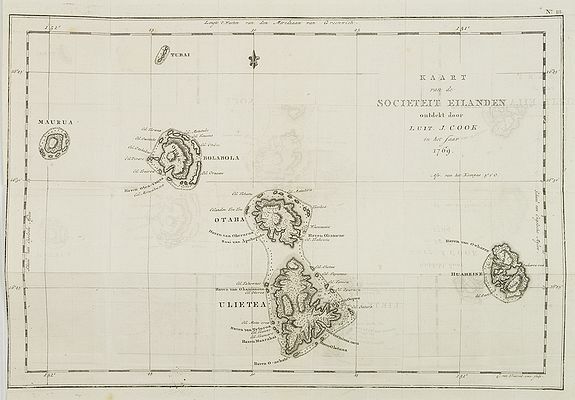 Description :Map of the islands of Maurua, Bolabola, Otaha, Ulietéa and Huaheine. In upper right corner "N° III". As James Cook writes in his journal on page 39 : "So call'd by the Natives and it was not thought adviseable to give them any other names but these three together with Huaheine, Tubai, and Maurua as they lay contiguous to one another I have named Society Isles ". This map is taken from a Dutch edition of James Cook's first voyage. Captain James Cook, explorer, cartographer and hydrographer went to command several notable voyages, the first was from 1768-1771. He was led to his commission by the direction of British overseas exploration in 1766 as commander of HM Bark Endeavour for the first of three Pacific voyages. Cook later mapped the complete New Zealand coastline, making only some minor errors. He then sailed west, reaching the south-eastern coast of the Australian continent on 19 April 1770, and in doing so his expedition became the first recorded Europeans to have encountered its eastern coastline. Cook's journals were published upon his return, and he became something of a hero among the scientific community. Cook's 12 years sailing around the Pacific Ocean contributed much to European knowledge of the area. Condition : Foldings as issued. Lower half left margin cut to plate mark . Slight offsetting of ink due to folding of plate. Else good condition.